Jaylen Fryberg performs in his dance regalia during the Paddle to Squaxin Island, August 2012. Herald writer Andrew Gobin is a member of the Tulalip Tribes and grew up on the reservation. TULALIP — What do you say about a young man whose actions forever changed the lives of so many? You can seek rhyme and reason, you can analyze his troubles, you can gaze into the abyss of disbelief. This is not about gun control, this is not about how a community failed a young man, and it’s not about using his troubles to solve everyone’s problems. Strangers are telling Jaylen Fryberg’s story. Strangers who never met him. What do you say about a boy? You say who he was. Jaylen Fryberg came from a large, influential family on the Tulalip Indian Reservation. His grandfather, Ray Fryberg Sr., sat on the tribal council and is the director of Cultural and Natural Resources for the tribes. His grandmother, Sheryl Fryberg, was an executive with the tribes for many years, most recently the general manager of tribal government operations. His father, Ray Fryberg Jr., also works in Natural Resources for the tribes. His mother, Wendy Fryberg, a former Marysville School Board member, is deputy general manager for tribal government operations. He has two sisters, Tenika Fryberg and Mekyla Fryberg, and two brothers, Anthony Gobin and Julian Fryberg. Jaylen was grounded in the traditions of the Snohomish people, his people, on the Tulalip Indian Reservation. He was a star wrestling and football athlete since he was young, competing with his cousins. He was an avid hunter and fisherman, from a place where rites of passage include those skills. Jaylen came from a traditional family with a strong presence not only at Tulalip, but with tribes up and down the Pacific Northwest coast. He sang and drummed with the men of his family, learning to lead the group at a young age. His father and grandfather were dedicated to grooming Jaylen to be a strong leader, like so many of his elders. His great-grandmother, Della Hill, was a strong spiritual leader in the Shaker faith throughout Northwest reservations. That was a path Jaylen and others in his family followed. As he grew, Jaylen learned to revere traditional dances, earning his dance shirt and feather headdress. The shirt is embroidered across the chest and along the sleeves with small paddles hand-carved from cedar. The paddles clacked as he danced. 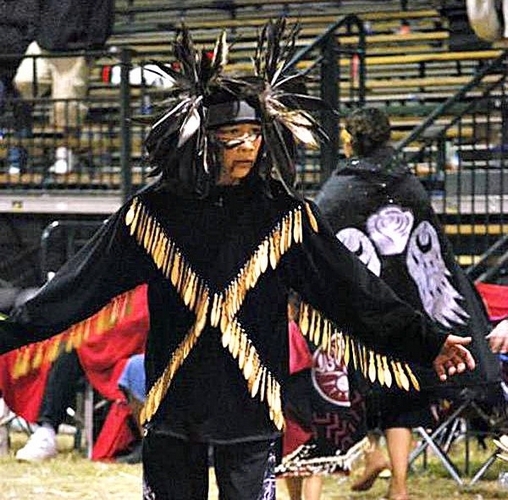 The shirt and headdress were presented to him by tribal elders who chose him to be a lead dancer. Along with these came the responsibility to carry on tribal traditions. He wore the dance shirt and headdress often, at tribal ceremonies and the annual Canoe Journey, a summertime celebration of cultural heritage. From the time Jaylen was 5 or 6, he was involved in sports. He wrestled on the tribe’s team and played football on city and school teams, including this year as a freshman with the MPHS Tomahawks. His teammates, often cousins and friends, were closer to him than brothers. Jaylen always made time for them. He learned to fish for salmon using gill nets with his father and grandfather. Many Tulalip families are fishing families. At 14, Jaylen started high school at Marysville Pilchuck. He seemed to have it all. He was in a long-term relationship with a great girl, was part of a strong family, pulled down good grades and was on the football team. High school can be stressful, but he seemed to be handling things well enough. The truth is, no one saw this coming. A few outbursts on social media, a few scuffles, normal freshman angst that came with normal consequences. After Friday’s events, we are left with questions that may never be answered. Jaylen got in a fight and was suspended from the football team just before a crucial game. Two of the boys he shot — Andrew Fryberg and Nate Hatch — were his cousins and also on the football team. Were they targeted because they would play in the championship game that night? We don’t know. He had separated from his girlfriend, and it is speculated that caused an argument. Contrary to many news reports, his girlfriend did not attend Marysville Pilchuck. She was not among those shot. And there is talk of bullying. All six of the students involved were close. They grew up together. They competed together. They went to homecoming together only a week before. Did they tease each other? Of course. That’s what cousins are for. We know Jaylen became troubled. Why is not clear. What he did in that cafeteria was monstrous. His uncle, John Dumonte, told TV reporters, though, that Jaylen wasn’t a monster. As someone who walked with him in this community, who knew him from the time he was small, I understand that sentiment. Culture and tradition can fall away. Not for Jaylen. He was viewed as living hope for the tribes’ future. The shaken community on both sides of I-5 now must put the pieces together, to help each other learn how to heal from this, to understand why. This entry was posted in Top Story and tagged Jaylen Fryberg, MARYSVILLE, School, shooting, student, Tulalip by Kim Kalliber. Bookmark the permalink.